Recently our engineers have developed a new addition to your existing traffic counters that guarantees that your systems should not go down even with hard power shut downs or complete loss for extended periods of your internet service. This new equipment is so well designed that it is nearly impervious to electrical storms or internet failures and has a lifetime hardware guarantee so you don’t need to worry about it. What we do is add an additional new circuit board called a Visual Proof Cape that includes internal Nickel Metal Hydride rechargeable batteries (built in UPS), so the system is guaranteed to turn off properly during hard power losses and is guaranteed to restart without human intervention every time! We also have a built in internal time clock which guarantees that the time on the photos is always 100% accurate. Finally, there are numerous internal diagnostic features and protective functions that guarantee your 8 gig backup memory is always working perfectly for many years to come. We give you full credit for your original equipment so the additional cost of these additional features is only $495 per store. The regular price for our new Visual Proof System is $1995 each. We have a dealer in Georgia who lost internet for 2 weeks because a truck ran into his transformer on a telephone pole and it caught fire. When they restored internet all traffic counts and pictures populated for the correct time for the entire period. Please let us replace the stores so that you don’t need to worry about this again. Also the installation is a simple replacement that will take no more than the minimum time per store and Marathon Deployment is the most reasonable priced and one of the best to do this. I think they are the most professional and easiest to work with. You just say the word and they get it done very quickly! What that means to you is that this new system has an 8 Gig memory that stores your photos and traffic counts and the instant a connection is re-established your pictures and traffic counts automatically appear on your TRAX website. Please see the details below on the new features and why this new traffic counter will give you everything you want in a traffic counter for the next 2 decades. This is the world’s best people counter because we have added its own internal restart battery and time clock. In other words, if your internet quits for any reason our new system will continue to fight to reconnect until it succeeds and when it does connect (if you did not lose power altogether during this period), then all of your pictures that were taken when your system was down are guaranteed to restore in the proper hour where they occurred and will all upload to your eTRAX web site. I GUARANTEE it! The cost of the Visual Proof v2 is $1995 and we will give you a credit of $1500 for your original system if you want to upgrade. The truth is that you should probably not upgrade any of the original Argus sytems unless you are having an issue with power fluctuations or internet connection problems that cause resets or brownouts. But if you are, this is the best solution. Please call us if you want more information. • Argus 2 with internal Nickel Metal Hydride backup battery so if you lose power the system shuts down properly then restarts automatically as soon as power is restored. • Internal built in POE for reliable solid service. • Internal LED’s for diagnosing status and identifying any port closure issues. • Internal Backups that automatically upload pictures and counts that were taken while the internet was disabled for any reason. • It has a real time internal clock so you do not need to rely on UTC outside services. • Micro UPS that is fully functioning while simultaneously writing to the 8 Gig backup SD card. • The system has been tested in our offices at 70 degrees below zero Celsius (Approx -120 degrees below zero Fahrenheit and over +200 degrees Fahrenheit) so will withstand any attic extremes. • The system has been tested with a simulation of over 5000 on/off cycles and still performed perfectly. • The Argus 2 also has internal back up Nickel Metal Hydrate rechargeable batteries that should last 20 years and are easily replaceable. • We have spared no expense in our efforts to make this the best traffic counter in the history of the business. We have even waterproofed the primary circuit board to add long term performance. The system will not work under water, but we wanted to make it highly resistant to moisture issues. #2. Because it includes 100’ of speaker wire and volume control only your sales associates here it. Not the new customer that just walked in. #3. The Directional Smart Door Chime only goes off when people walk in, not when they leave. Salespeople have convenient hearing and now when they hear a chime they know that a new opportunity just came in the door. 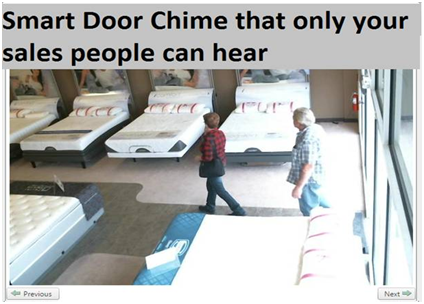 The Directional Smart Door Chime we believe will help your salespeople provide better customer service. It’s a new directional smart door chime that only goes off when people walk in, not when they leave. Most salespeople have convenient hearing and tend to ignore a door bell or security buzzer that goes off all the time. It also comes with 100 feet of speaker wire so it can be installed in the back area so only the sales people hear it, not the customer who has just entered, and the volume can also be adjusted insuring a higher level of professionalism in all your stores. We believe it will help you improve customer service and the biggest advantage is that it holds the traffic counter accountable for perfection. If you see someone come in and you did not hear a chime then something is wrong with the counter. Audible Entry Tone with volume control and different tones for each different entrance so you know exactly where the customer is coming from if you have multiple entrances. Please add $199 for this additional software and device. The door chime is plug and play and instantly connects and begins to work. We include 100 feet of speaker cable for your convenience. This Directional Smart Door Chime is also interesting because it holds our system accountable for immediate accuracy because it only goes off when someone enters. If you do not hear a tone it did not count anything. Furthermore, if you are hearing events any other time it lets you know. For example, our system will attempt to capture an event if someone is leaving and someone else is entering at the same time. To give you a better synopsis of all activity the directional smart door chime makes tracking the accuracy of the system that much easier for you. Here is the list of reports that we provide at this time not including the reporting we can provide for the CRM part of our program that dovetails with our traffic counter reports. This actually provides another 50 reports that help salespeople follow-up with unsold potential customers that I discuss in the second video. BABTA Stands for Below Average Brought to Average and is a Trademarked term. 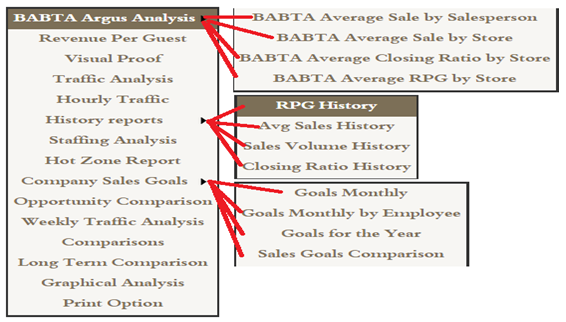 • BABTA Average Sale by Salesperson….. Identifies any salesperson with an average profit that is below the company average and also identifies how much more they would earn for the company if they simply hit the average. • BABTA Average Sales By Store…. Same as previous but totaled for each store and especially powerful when dealing with larger companies and also the corporate overview. • BABTA Average Closing Ratio by Store…. • BABTA Average RPG by Store…. Aaron, this is one of the most powerful reports we provide. RPG “Revenue Per Guest” is the profit on every opportunity that comes into the company if they purchase or not and is the truest measure of a company’s potential. • Visual Proof is where each dealer or individual showroom manager can go in a view or remove pictures of employees or for example the mail man and for the first time in retail history have an easy to monitor nearly 100% accurate customer traffic count. • Traffic Analysis is an analysis of daily weekly, monthly, quarterly or yearly on one easy to read screen also displaying percentages of differences for each period so you can easily see immediately if as a dealer you are getting better or getting worse! This report also may be viewed by Showroom, City, State or Profit Center. • Traffic Patterns is a monthly big picture of all traffic patterns for the entire company and if desired individual showrooms. It includes color coding analysis making the very busiest days stand out. • Hourly Traffic is a weekly analysis of hourly activity with totals for each day and totals for each hour of the week. • History Reports 4 reports that track long term history analysis of RPG, Average Profit by store, Sales Volume compared to traffic and Closing Ratio History. • Staffing Analysis details the comparison each hour of sales coverage compared to true customer traffic patterns. • Hot Zone Report is the comparison of employee coverage per hour to actual customer traffic on a color coded weekly report that immediately tells a dealer if they are overstaffed or understaffed at any time during the week. • Company Sales Goals 4 reports that comprise a proprietary sales goals program that breaks down the weekly profit goals for each salesperson and insures that they are aware of their position compared to the rest of the company. • Opportunity Comparison is a report that compares dealers who are using our CRM program to the traffic counters and is an additional tool that depicts issues with staffing in any showroom at a glance. • Weekly Traffic Analysis is designed to compare for marketing purposes if the entire company is getting better or getting worse regarding customer traffic and allows a dealer to hold advertisers accountable for poor performance sometimes providing the dealer free make goods if the advertiser underperforms. • Comparisons Monthly analysis of daily comparisons of traffic to last year in a bar graph format. • Long Term Comparisons allows the dealer to easily analyze a seven year history of the entire company or any individual showroom by day, week, month, or quarter. • Print Options allows the dealer several auto printing functions but most clients prefer the auto email capability that allows them to select multiple reports and have them emailed daily or weekly.